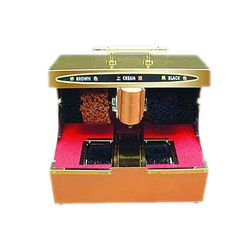 Our range of products include shoe shining machine with sole cleaner and automatic shoe shining machines. 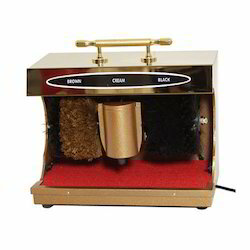 Our organization is an applauded name in providing Shoe Shining Machines to our clients. These are able to work in precise manner using infrared rays. These machines are useful for long term application and are provided with automatic rotating mechanism. These machines remove complete dust particles. These machines are available in different specifications and have automatic mechanism. We are a standout organization offering Automatic Shoe Shining Machines to our clients. These machines have got excellent design and are used in shining of shoes. These work in reliable and efficient manner for years and give ultra shine to shoes which gives them new appearance. These machines are easily installed and work in excellent manner under different operating environment. These machines are offered at reasonable price.